An installation by Artnode, 2001. Users’ Club was exhibited at Statens Museum for Kunst(The Danish National Gallery). In 1925, Aleksandr Rodchenko designed “Workers’ Club” in conjunction with Exposition Internationale des Arts Décoratifs et Industriels Modernes in Paris. “Workers’ Club” was a new, post-revolutionary reality – a public place which could offer political enlightenment and debate, as well as a place, which could provide renewed energy after a long working day – a place, which could help maintain the revolutionary identity. 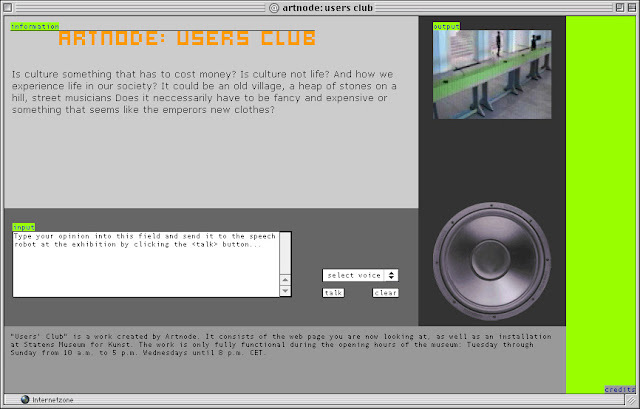 With reference to Rodchenko’s “Workers’ Club”, Artnode has created “Users’ Club”. A public place for the freedom of speech. After the digital revolution a new reality has been created for open communication; a great, indefinite mouthpiece called the internet, where everyone has the opportunity to manifest him or herself. A new, large, indefinable group, “Users” has come to life in the society of networks. “Users’ Club” is a chatforum at Statens Museum for Kunst. A microphone into which you can say what you think of art. What you think of “Art in the Society of Networks”. “Users’ Club” is a chat, where, via the internet, you can see the visitors at Statens Museum for Kunst and tell them what you think and they may answer you in return. 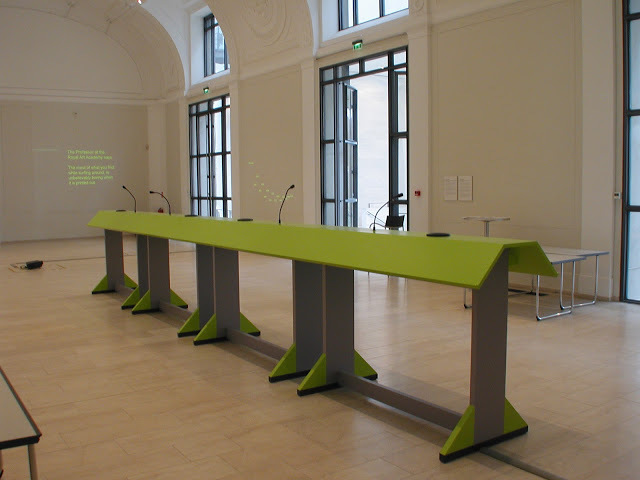 “Users’ Club” consists of a 8 m long table with 4 microphones set up at Statens Museum for Kunst and an internet page at www.artnode.dk– From these two public positions one can submit spoken messages to either users at Statens Museum for Kunst or to users on the internet. “Users’ Club” consists, therefore, of two poles, from where dialogue may appear the moment someone starts to communicate and thus becomes “user”. “Users’ Club” is the second part of Artnode’s“High Density”project.